First of all a big sorry to all those Apple fans out there. I know all of you were eagerly waiting for Apple to launch its first Smart speaker in the form of HomePod. You will know the reason why it isn't the smartest speaker out there by the end of this Apple HomePod review. A Siri-enabled WiFi-Speaker from Apple, wasn't this the dream of all die-hard fans out there after seeing Amazon's Echo and Google Home? After a successful release of Apple AirPod, which was their first wireless headset, the company is now stepping on to the platform of Smart speakers. After Google Home and Amazon Echo, it's the Apple where a top-brand is bringing their own Smart Speaker to the market as an accessory for their consumers. Like every other smart device, Apple HomePod also has its pros and cons. Although Apple has joined the party little late, they have made some real noise with their new entry product. Apple HomePod is considered to be the best sounding Smart Speaker by some of the top reviewers who have got their hands on the product. But with Google and Amazon out there competing to win the Smart Speaker-market for quite a long time, will the Apple HomePod be able to hold themselves in this tight competition with their new entry? Let's quickly jump into the complete review and find out, also by the end, you'll see whether this product is able to qualify itself in fulling all the essential functions that a user is expecting from a Smart Speaker. Design-wise, Apple HomePod is somewhat similar to the shape of Google Home, but as a bulkier version. This new Smart Speaker from Apple has surely got an elegant design although it is compact. As HomePod is completely wireless by connecting phones only through Bluetooth or via wireless connectivity between Apple devices, it doesn't provide any ports to take in any music playable devices. 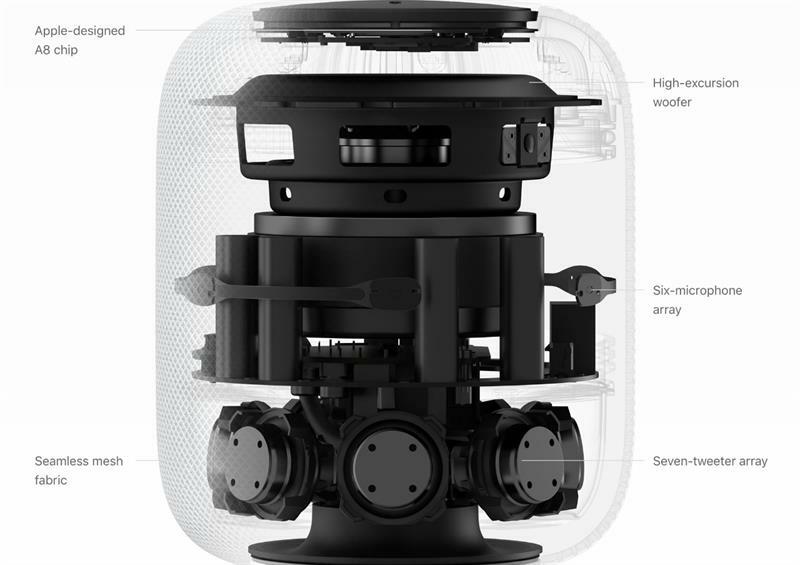 With only 7 inches tall, the HomePod is very compact and can fit anywhere in your home. The mesh fabric, which is the outer most layer with which the complete device is wrapped, is very much appealing from every angle you look at. On top of the device, you get a round touchscreen with illuminated volume triggers on each end and in the middle, it delivers a Siri indicator that lights up when you are using it. If you tear down the outer mesh fabric of the device, there is an A8 chip, which is the brain of Apple's HomePod. And right below it there is a high-excursion woofer that fires upwards and it is where you get all those high beats from. Right at the center of the device, there is six-microphone array by which you are able to control the HomePad with your voice from any direction. Down at the bottom is the placement of seven-tweeter array which is facing outwards to deliver maximum effective volume. 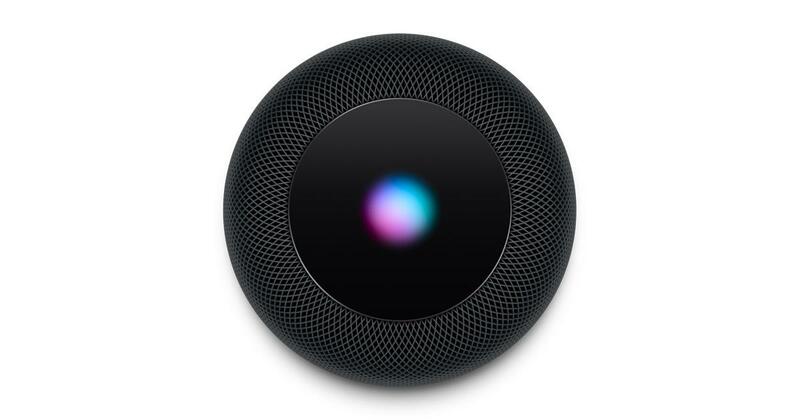 Connecting to the HomePod with your iPhone device is as simple as bringing your phone anywhere near the speaker. A screen pops up on your iPhone asking you to connect to the speaker and within just a couple of taps, you are connected. The built-in awareness system in the HomePod makes it capable of automatically adjusting and giving out an optimal sound. Even when your songs are playing at the highest volume, the device can still hear you calling from anywhere in your room. 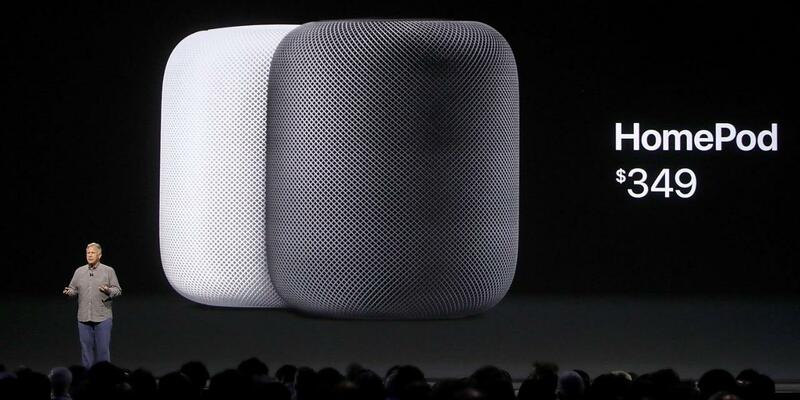 With the placement of seven-tweeter array inside the device in a circular way, Apple has made this tissue box-sized HomePod enough to fill a large room with blasting sound which can be heard evenly from every direction. So you place it anywhere inside your home and no doubt it will sound perfectly fine without losing a single drop of sound quality. One among the coolest feature of HomePod is that the built-in technology allows the device to adapt the room location and work accordingly. Which means that it can automatically analyze the positioning and can tune the sound accordingly. If you use only Apple's music service, then the HomePod is just a perfect assistant for you, but if you love to hear music from Spotify, as a lot of people out there do, your bad luck starts here. Since Apple HomePod won't support Spotify, you're left with an only option to hear your favorite songs by connecting your iPhone and playing Spotify remotely in HomePod, which will then automatically disable the Siri function within the Speaker. But even if you're an Apple Music lover, still it won't allow you to play songs unless you're subscribed to their services. The major drawback is that this product doesn't offer calendar or recipe functions like what the Amazon Echo or the Google Home does with their Smart Speakers. Another biggest flaw about HomePod is that it can never distinguish between the voices of its own owner and an intruder who might be your guest or your kids. As the HomePod is connected to your phone and can read out or send messages, anyone can read out your messages from your locked iPhone or send messages. By disabling the function altogether will be the only way to hide your privacy. 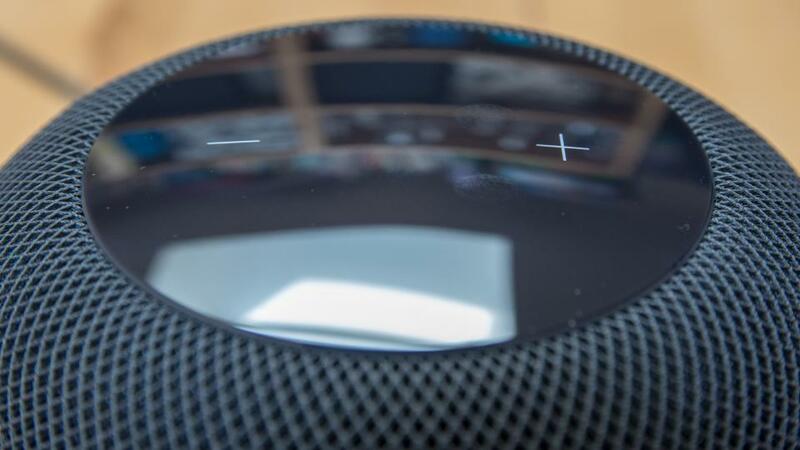 Although the HomePod is absolutely stunning to look at, the fans are already complaining about its rubbery base which tends to leave a stain on polished surfaces. So if you already own yourself an Apple HomePod, then be sure you don't ruin your furniture. Apart from that, the device is also incapable of pairing it up with iMac or any other computers. As mentioned earlier, it also delivers no ports to connect to external devices like a USB pen drive or connecting other music devices with the use of AUX cable. Although the Apple HomePod delivers all those cool and amazing features that you expect a Smart Speaker to offer, it comes priced at $350 (roughly around Rs 22,200) which is very much expensive compared to other Smart Speakers out there. With this price, the HomePod price nearly hit to that of the top-end variant of Google's Smart Speaker, the Google Home Max, which is currently sold on markets at a price tag of $400 (nearly Rs 25,500). For the same reason, HomePod is best suited for a comparison with Google Home Max. As far as the availability of Apple HomePod is considered since the HomePod is already launched in the American markets, it will soon be available in Indian markets with a slightly higher price than expected. Should you buy Apple HomePod? It absolutely depends on your personal likes and dislikes. If you're a die-hard Apple fan who is ready to accept all the shortcomings considering that it is the company's new step into the market, then Apple HomePod is the one you must go for. But keeping aside the brand value, if you're a give and get-type of guy who is aiming at what the company is offering for the price you pay for, then I recommend you to stay away from this product and go for better Apple HomePod alternatives like the top variant of Amazon Echo or the base variant of Google Home. I also suggest all those Apple fans to patiently wait for the next release of the HomePod as they will surely evolve by clearing out all the shortcomings that they have faced in their first device.